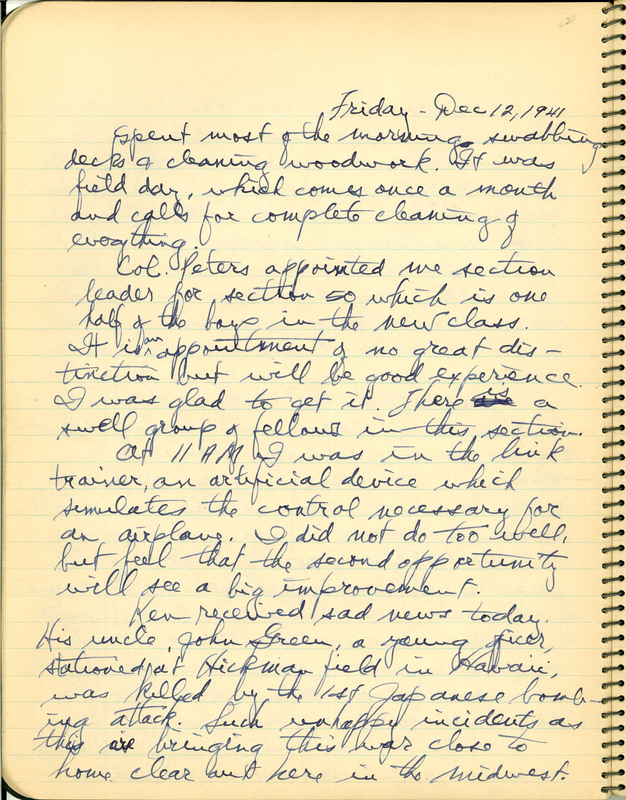 Friday - Dec 12, 1941 Spent most of the morning swabbing decks & cleaning woodwork. It was field day, which comes once a month and calls for complete cleaning of everything. Col. Peters appointed me section leader for section 50 which is one half of the boys in the new class. It is an appointment of no great distinction but will be good experience. I was glad to get it. There is a swell group of fellows in this section. At 11 AM I was in the link trainer, an artificial device which simulates the control necessary for an airplane. I did not do too well, but feel that the second opportunity will see a big improvement. Ken received sad news today. His uncle, John Green, a young officer, stationed at Hickman field in Hawaii, was killed by the 1st Japanese bombing attack. Such unhappy incidents as this are bringing this war close to home clear out here in the midwest.